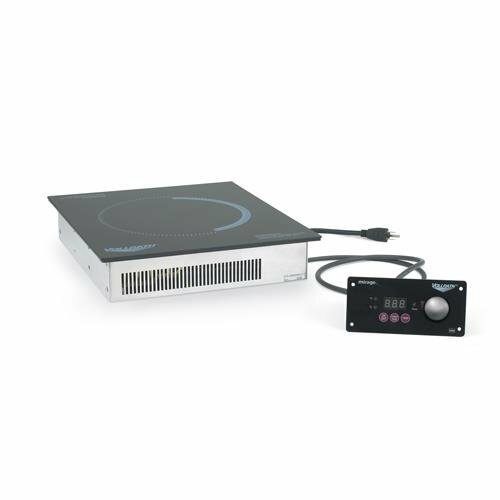 Mirage commercial drop-in warmer is built with durability and high performance, making it a great option for cooking needs. Cutting-edge dial control with high-speed power and temperature adjustment - includes 1-180 minute timer function. Designed for commercial sauté and warming stations. Countersunk installation creates sleek, easy-to-clean counter work surface. Maximum pan size is 14-inch. 120-volt, 0.45-kilo watt, 3.8-ampere, 5-15P plug. Cutout measures 11-3/4-inch by 13-3/8-inch. Measures 12-1/2-inch width by 14-1/2-inch depth by 2-7/8-inch height. Dimensions (H x W x D): 2.88" x 14.5" x 12.5"
If you have any questions about this product by Vollrath, contact us by completing and submitting the form below. If you are looking for a specif part number, please include it with your message.